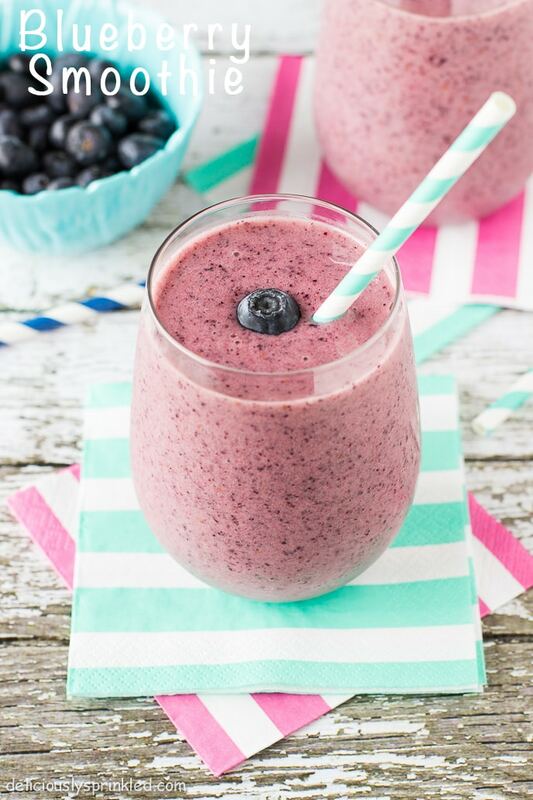 This Blueberry Smoothie is an easy, on-the-go breakfast smoothie that taste delicious and it’s even healthy! After stuffing my face at the very delicious Mother’s day brunch yesterday! I needed to get back on track, so I thought I would share with you the super-healthy Blueberry Smoothie I made this morning. And it’s super simple to make! I just loved the color of this smoothie and when you start your morning drinking out of a wine tumbler, you know it’s going to be a great day! 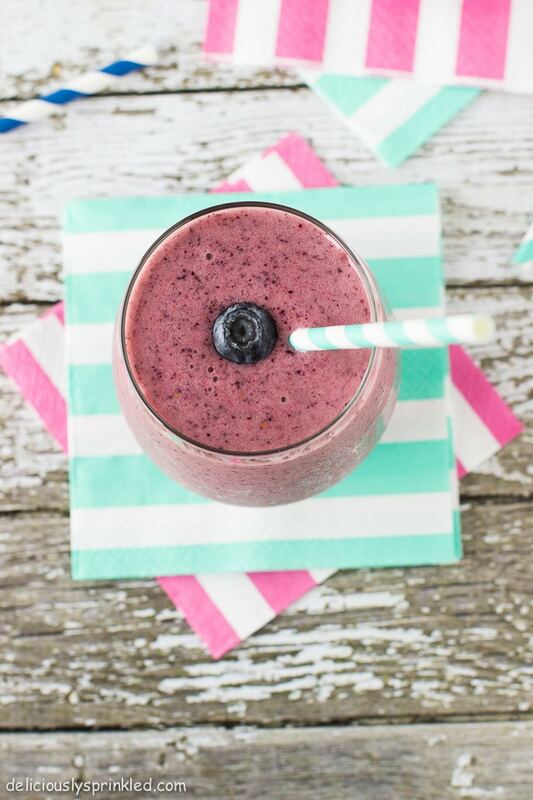 You only need 5 ingredients to make this smoothie, all you need is blueberries, strawberries, bananas, blueberry yogurt and ice. Blend all the ingredients together and you have a delicious breakfast or snack smoothie that will give you an excuse to enjoy a yummy slice of Orange Cream Cake or a Lemon Raspberry Cookie because you started your day out healthy. Right!? Serve and drink this smoothie immediately. The longer it sits, it will begin to take on an not so appetizing gray color from the blueberry pulp. If you use frozen blueberries, strawberries and bananas omit ice cubes and add 3/4 cup of milk. Place yogurt, blueberries, strawberries, and bananas into blender and blend until only a few small chunks remain. Add ice cubes and blend again until smooth or desired consistency, scraping sides occasionally. Pour into glasses, top with a few more blueberries and serve! 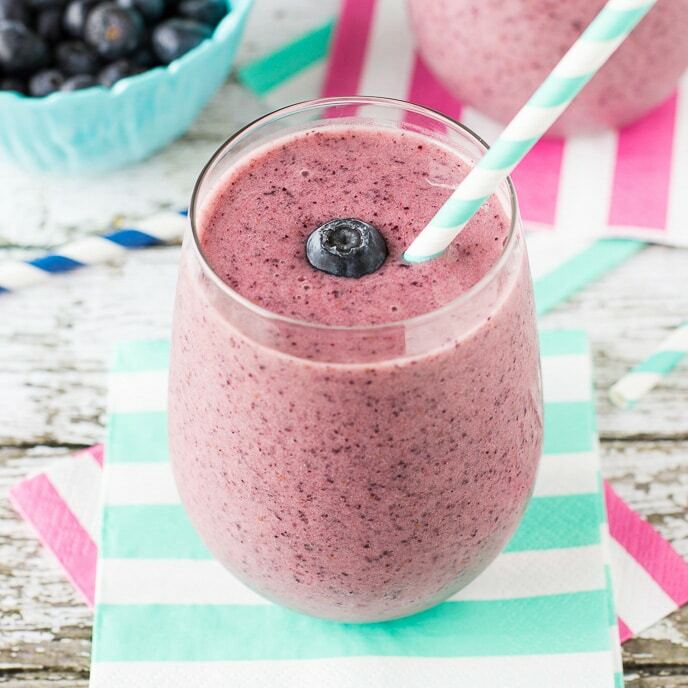 *If using frozen blueberries, strawberries and bananas omit ice cubes and add 3/4 cup milk. I adore fruit smoothies like this!! They definitely hit the spot and always make me feel so much better after indulging in too many desserts! 😉 Beautiful pics, girl! This is one seriously gorgeous smoothie. I love blueberry so it’s right up my alley. Yum! I just love smoothies!!! This couldn’t be simpler to make, great for you and the photos are outstanding! Love it! Oooo how yummy!! Love they color! I just love the bright color! I’d love to drink this for breakfast! Easy, on the go recipes like this smoothie are the best! I need more blueberries, antidioxidants and smoothies like this in my life. Gorgeous photography, btw! I love the color of this blueberry smoothie and drinking out of wine tumblers definitely gets the day off to a great start! I’m envious of your photography!! Your photos always look so amazing and the colors are so great. I’d love one of these smoothies right about now! I could use this after my indulgent weekend, too! I am loving these colorful step by step photos, Jenn! I could definitely use something lighter like this in the morning after this weekend as well. Ain’t that the truth! After every holiday, my system starts to crave smoothies. Blueberries are simple, but so refreshing! Delicious! This looks like it would be so fun to drink and with the warm weather here, simply perfect! So delicious looking! I will try this! Smoothies are my life. Love this one! delicious, healthy and refreshing, perfect breakfast for summer time! GORGEOUS photo! Has me craving a smoothie!! Jenn, I am loving the colors in your photos! Great pictures too!